The American healthcare industry is growing exponentially, and a medical terminology course can help assure your success working within this world. The expansion of this industry is creating jobs that are increasingly specific to particular facets of the medical process. As a medical claims specialist, your area of involvement exists within the ever-essential conduit of money flow from one entity to another. You are tasked with mediating between providers and insurance companies concerning payment for medical goods and services rendered to policyholders. This area relies heavily on terminology to explain organs, bones, bodily systems, symptoms, conditions, diagnoses, procedures, prognoses and prescriptions in order to describe medical situations. Just as people in the legal world speak legalese, accountants speak numbers and software programmers speak HTML code, your profession demands that you possess detailed understanding of the vocabulary of medicine. This subset of the English language contains elements of the everyday vernacular interspersed with archaic Latin and Greek words, lengthy polysyllabic terms and ambiguous abbreviations. A medical terminology course can equip you to excel in this arena by preventing miscommunication, ensuring clerical accuracy and enabling efficiency. You will then learn about the sensory intricacies of the eyes and ears as well as the integumentary system of the skin. Finally, a module on diagnostic procedures and pharmacology will familiarize you with terminology concerning specific conditions and ailments and the various medicines prescribed to treat them. Having online access to a medical terminology course means learning through the audio and visual aspects of the training modules. Material is reinforced through interactive review exercises. Challenging medical terms can be mastered by a playback feature that allows you to hear the correct pronunciation of uncommon words as many times as necessary. Tests are given to assess your progress as you move through the material, and answers to quiz questions are accompanied by detailed explanations for future reference. A wide variety of games designed to enhance your learning experience are also a part of this course, accompanied by case studies, multimedia animations and a glossary of terms and definitions. A dynamic array of teaching methods assure that the detail-heavy nature of the material is presented in engaging, interactive formats that encourage learning through audio playback and colorful infographics. The Medical Terminology for Health Professions course is designed to prepare you to successfully communicate with other health professionals by enabling you to understand the meaning of medical terms, root words, prefixes and suffixes. Your ability to recognize basic medical terms will allow you to process medical claims in an efficient manner without having to continually search for the definitions of medical diagnoses, procedures and conditions. Medical abbreviations are frequently used in all aspects of the industry, and learning how to decipher them through this course will let you experience the benefits of efficient correspondence rather than the hindrances of miscommunication. You will learn to spell and pronounce essential medical words and terms that, while uncommon in everyday language, are used daily in the medical world. There are thousands of words that are specific to the medical world, and while this course in medical terminology teaches you the fundamental vocabulary, it also teaches the skill to decipher advanced terminology through deductive analysis. You will learn medical root words, prefixes and suffixes so that you can dissect unfamiliar terms and extract their meaning by understanding specific parts of the words. For example, the suffix “itis” indicates inflammation of a specific part of the body, while the term “ectomy” means the removal of a certain part of the body. 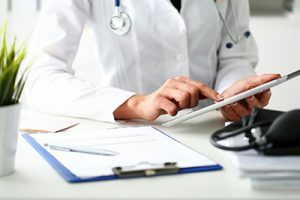 The differences between tonsillitis and a tonsillectomy, while involving the same body part, are quite significant — and will mean very different ways in which a medical claim is transcribed. Meanwhile, the word “operative” means a surgical operation, yet when it is paired with a variety of prefixes, it’s can change significantly. This course will allow you to know that the prefixes “pre,” “peri” and “post” — when paired with the word operative mean either before a surgery, before and after a surgery, or only after a surgery, respectively. Your one-year access to this online medical terminology course allows you to learn at your own pace and awards you a “passing” status with a 70% average on module tests and a short overall course evaluation. Upon completion you will earn 9.5 Continuing Education Units (CEUs) authorized by the International Association for Continuing Education and Training. Your certificate of completion allows you to demonstrate to recruiters and future coworkers that you are serious about a career in medical claims, and that you took the necessary steps to educate yourself so that you can effectively communicate in the language of medicine. You can submit the details of the course to your institution before enrolling to ensure CEUs will be accepted and applied. Contact Corexcel to enroll in our online medical terminology course and begin your education in the vast vocabulary of the world of medicine. Understanding this language will empower you to excel as a medical claims specialist.